I just finished my first Christmas book. 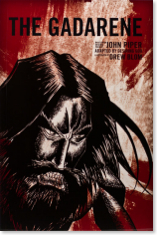 It is called The Gadarene and it is a graphic novel based on an original poem by John Piper. It was a really interesting book. It is obviously fictional, but based on the encounter between the demon possessed man and Jesus. This is the story that is found in the books of Matthew, Mark and Luke (clink this link to read all three gospel accounts). I enjoyed the writing style and the artwork of this book. I would recommend this to all interested. I would also recommend this to teens and pre-teens. Piper adds in a back-story that fills in the gaps of how a person might have ended up in a situation like this which adds an element of currentness (is that a word?) and made the idea of a demon-possessed man more understandable.